The United States Department of Labor has certain regulations requiring posters or notices to be displayed in the workplace. Learn what workplace posters are required by the U.S. Department of Labor for retail businesses and how to get copies of the posters in electronic formats. Be sure to check with your state's labor department and other agencies as additional workplace posters may be required under state law. Required by: Public agencies (including state, local, and federal employers), public and private elementary and secondary schools, as well as private sector employers who employ 50 or more employees in 20 or more work weeks and who are engaged in commerce or in any industry or activity affecting commerce, including joint employers and successors of covered employers. Penalties: Willful refusal to post may result in a civil money penalty by the Wage and Hour Division not to exceed $100 for each separate offense. Other Notes: Where an employer's workforce is not proficient in English, the employer must provide the notice in the language the employee speaks. The poster must be posted prominently where it can be readily seen by employees and applicants for employment. The Occupational Safety and Health Act of 1970 (OSHA) requires employers to keep their work environments safe for workers. The Act is administered by the Occupational Safety and Health Administration (OSHA), within the Department of Labor. Required by: Private employers engaged in a business affecting commerce. Does not apply to federal, state or political subdivisions of states. Penalties: Any covered employer failing to post the poster may be subject to citation and penalty. Other Notes: Employers in states operating OSHA-approved state plans should obtain and post the state's equivalent poster. 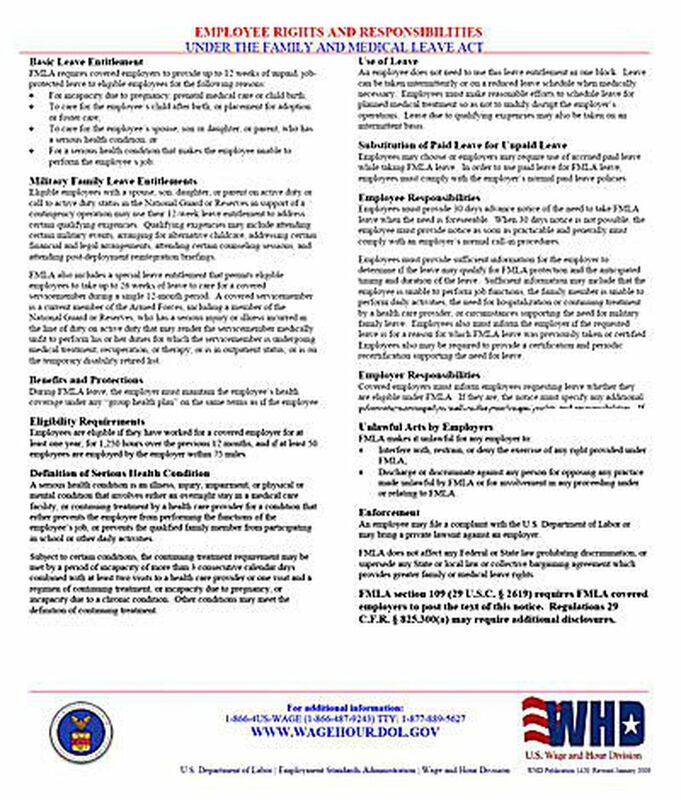 Required by: Every private, federal, state and local government employer employing any employee subject to the Fair Labor Standards Act, 29 USC 211, 29 CFR 5 16.4. Penalties: No citations or penalties for failure to post. Other Notes: Any employer of employees to whom sec. 7 of the Fair Labor Standards Act does not apply may alter or modify the poster legibly to show that the overtime provisions do not apply. Required by: Every employer having workers employed under special minimum wage certificates authorized by section 14(c) of the Fair Labor Standards Act. Other Notes: Where an employer finds it inappropriate to post such a notice, the employer may provide the poster directly to all employees subject to its terms. The Employee Polygraph Protection Act (EPPA) from 1988 is a federal law that prohibits most private employers from giving lie detector tests to employees, whether the use is for pre-employment screening or during the course of employment. Employers generally cannot even request that an employee take a lie detector test, let alone require it. Required by: Any employer engaged in or affecting commerce or in the production of goods for commerce. Does not apply to federal, state and local governments, or to circumstances covered by the national defense and security exemption. Penalties: The Secretary of Labor can bring court actions and assess civil penalties for failing to post. Other Notes: The Act extends to all employees or prospective employees regardless of their citizenship status. Foreign corporations operating in the United Status must comply or will result in penalties for failing to post. The poster must be displayed where employees and applicants for employment can readily observe it.